This articles outline the steps involved in replacing a bath fan switch with an electronic timing device. 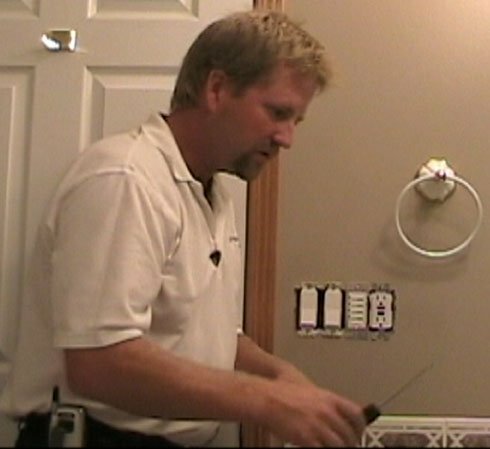 A standard single pole switch will be replaced with an electronic timing switch for the control of an exhaust fan in a bathroom. This eliminates the problem of bath fan switches left running. 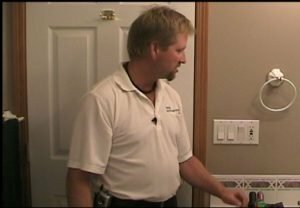 At the time I wrote this article, we had three bathrooms in our home, and two in our business. They all had a standard bath fan operated by a wall switch. Their purpose is fairly straightforward. HOWEVER …. Nothing drove my wife, Sandy, more crazy than finding one (or more) of these bathroom fans running non-stop. It’s a pet peeve of Sandy’s if Lyle (my son) or I should leave the bath fan running after showering, or using the other facilities. Or worse, to find that one of the office bathroom fans had been left running all weekend. 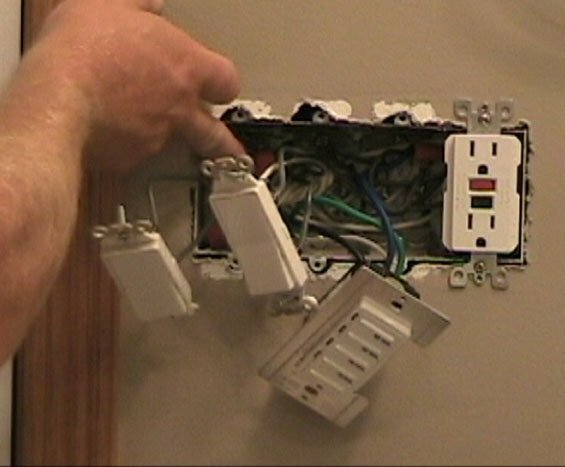 Fortunately, there is a solution – replace a standard bath fan switch with a timer switch. This will allow you to move the moisture out of the air with your fan, but limit the fan’s operation to pre-selected intervals of 10, 20, 30 and 60 minutes (this will vary, depending upon the timer switch model and type). 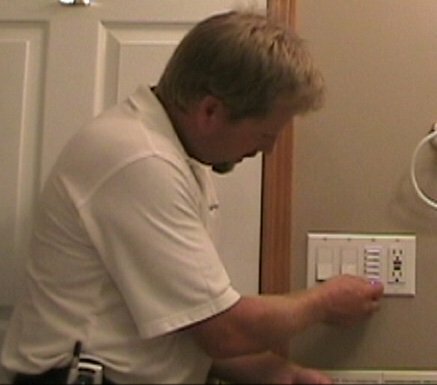 SO … no more wasted energy by having the fan run constantly, and no more frustration for Sandy – PERFECT! 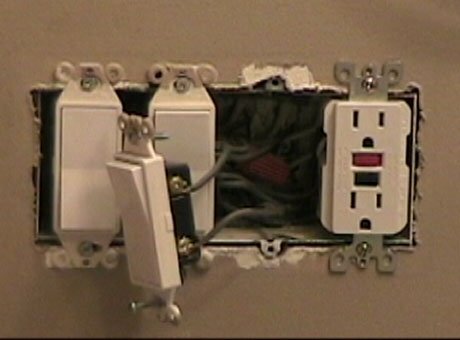 In the example we use in this article and supplemental video, we have an existing 4-gang outlet with three switches and a ground fault receptacle in the decora or decorator device style. 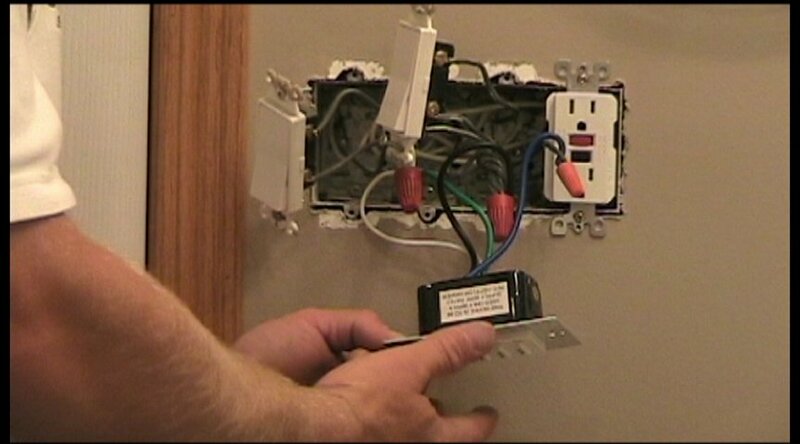 We will be replacing the switch that operates the bathroom fan with a Leviton electronic timing switch. Voltage testing device (multi meter, power pencil, etc. Step One – Ensure the Power is OFF Ensure that the power to the circuit is off, and arrange for an alternate light source (either battery operated, or an electric light plugged into a different circuit in another location). Step Two – Remove Cover Plate Remove all of the screws in the 4-gang decora cover plate. 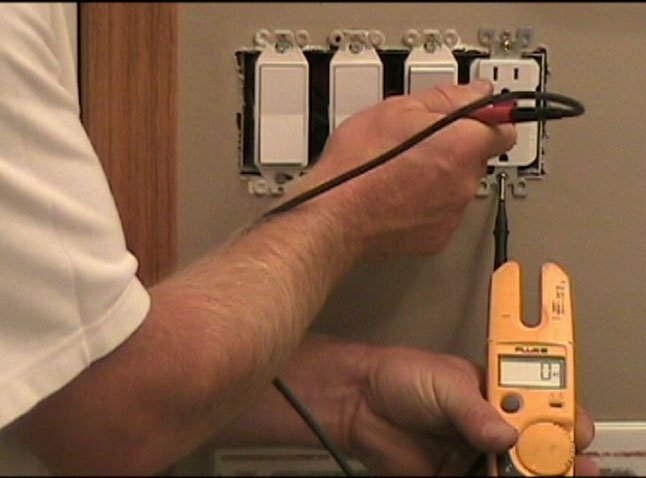 Step Three – Test the Circuit Double check with a voltmeter, power pencil, etc., to ensure that the power to the circuit is off. Step Four – Remove Existing Switch Remove the existing switch for the bath fan. 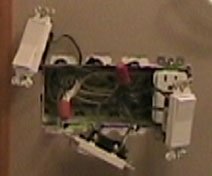 Note that in this example we have a lot of wires and splices in behind the switch and thus we won’t have enough room for the new device, as it is much larger and deeper than the regular single pole switch. 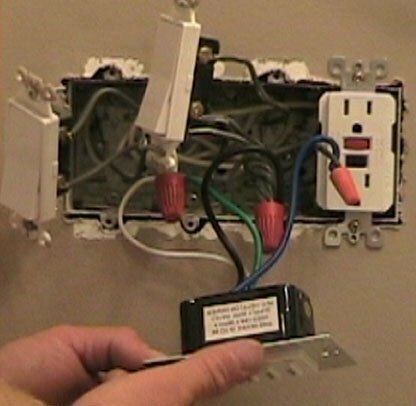 Step Five – Remove Additional Switches For the reason noted above, and the fact that the new device requires a neutral connection, we will have to remove all of the switches in this outlet box. 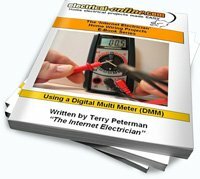 After looking over the wiring diagram that came with the timing switch (yes, reading the instructions is a must), determine what connections are required. 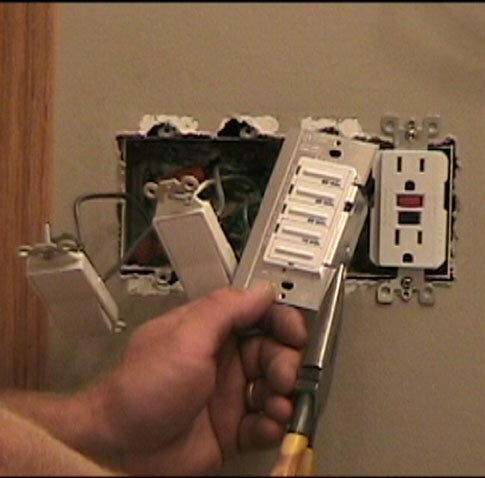 In the outlet box we will need to gain access to one of the ground screws in the back of the box to connect the timer’s ground wire to it. The white wire from the timer will need to be added to the neutral splice. 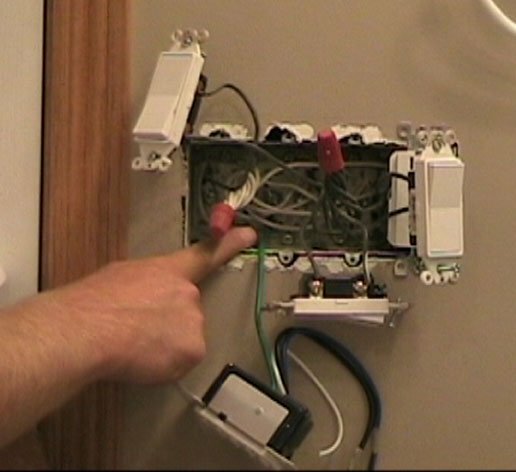 The black wire needs to be added in to the splice of black wires that have pigtail wires that connect to one side of each of the existing switches, and to the line in terminal of the GFCI receptacle. Remove the wire connector and remove the pigtail that goes to the existing bath fan switch. In its place you need to spice in the black wire to the timer. The black wire that was connected to the other side of the existing bath fan switch needs to be spliced to the blue wire from the timer switch. Now we need to push back all of the splices into the box, making sure that you have room for the new device. 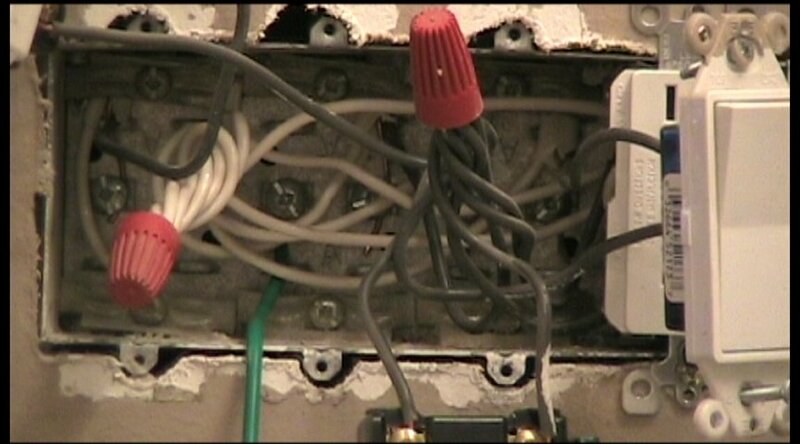 There is more space behind the single pole switches, so work the bulk of the splices in behind them, and be careful that when the devices are reinstalled, there will be no pinch points or pressure on the wires. Note that with this particular timing device, there are tabs that must be removed in order to fit within the space available in the multi-gang box. The tabs are scored for easy removal. Reinstall all of the devices. Test fit the cover plate and adjust device positions if necessary. Reinstall the cover plate and plate screws. Restore power and test the device. And there you have it – an easy solution to a common household dilemma. CLICK HERE to watch a video of this project. 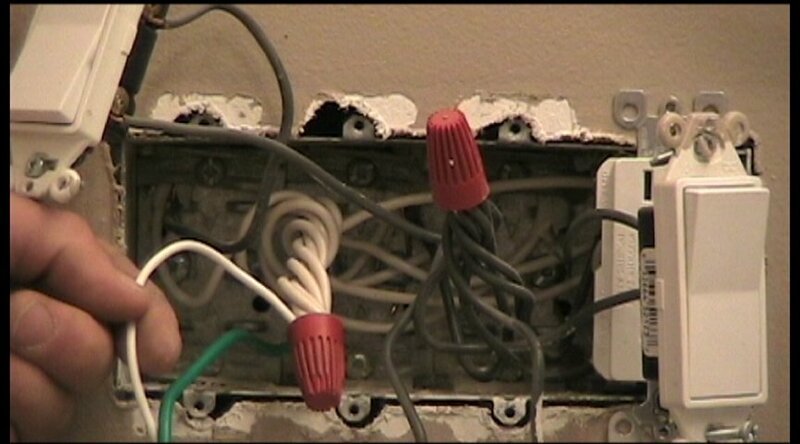 This entry was posted in Wiring Projects and tagged bath fan, bath fan timer switch, electronic timer, electronic timer switch, exhaust fan, fan, switch. Bookmark the permalink.